Bali Spa L’occitane is a French high-ranked cosmetic brand which produces perfume, skin care and body care products over 30 years. Mango Tree Spa made a contract with L’occitane on April in 2009. 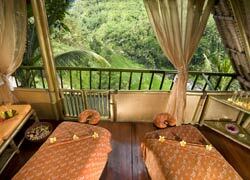 The spa is on mango trees that you can enjoy the great view of Ayun Valley ! 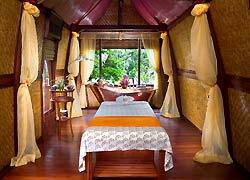 You can have not only Balinese Massage but also Swedish, Thai and Shiatsu Massages. Reserving Mango Tree's menus with special discount prices requires a payment made via our Japanese bank deposit transfer in 7 days advance. (1) After confirming a booking by email, we will inform you a total costs for the treatments which are converted into Japanese Yen based on an exchange rate in Indonesia. Based on the Spa regulation, if the payment hasn't been done by 7 days before of your reservation, it will be canceled. L'OCCITANE from Provance, France is a cosmetic brand which produce and sell products using plant materials by only using pure essential oil and natural materials to show respects to humans, animals and nature. They produce cosmetic products such as skin, body and bath care, and fragrances based on Shea, Immortelle, Almond and Aromachologie and so on. The sacred shea tree grows far from Provence in Burkina Faso, Africa. An incredibly rich, universal skin treatment, shea butter provides special and tender care for dry skin. Only the local women are entrusted with the secrets of shea butter preparation and only they benefit from its trade, which is why it is called “Women's Gold”. L'OCCITANE's long-standing partnership with this women's cooperative assists them in building a stable future for themselves and their family. Special plan that include spa and meal! Lets make memorable last day at popular spa, Mango tree spa! Deeply soothing and relaxing massage with the L'OCCITANE massage oil. This traditional Balinese massage combines long strokes, palm and thumb pressure to reduce tension, fatigue, and exhaustion, improve lymphatic and muscular system. This Relaxing Body Massage is based on Swedish Effleurages, combined with Chinese Acupressure points and long, kneading Balinese movements. Their specific massage oil of Aromachology blends pure essential oils of Lavender, Tea tree and Geranium which are traditionally known as enhancing benefits of the treatment and release all tensions and stress. This Massage is a variation of our Relaxing Body Massage combines Hawaiian Lomi Lomi with Acupressure and gentle stretching movements which works deeply into the muscles with flowing strokes and make nurturing and relaxing the body. For enhanced benefits, the whole sequence is performed with our specific relaxing massage oil of Aromachology. As a result, tensions and strained muscles are released and your whole body feels refreshed and deeply rebalanced. The excusive massage especially designed for any women who are in pregnancy over 4 months. It provides enhanced relaxations and well-beings. The massage which is based both Swedish and Balinese techniques relax the tensions and muscles of the back and legs with neutral oil which doesn't effect on an unborn child. As a result, you will be amazingly more calm, relaxed and regenerated to be ready to be a mom gratefully. Their unique body brushing deeply softens and invigorates a body. This smoothing massage will be performed all over the body with their signature brushes to remove dead cells and stimulate a micro-circulation. The acupuncture in the course enhances the body energy and body metabolism. The combination of Balinese, Swedish and Chinese massage technique make your mind and heart relaxed with lavender from East France. This exclusive mass age features all of their signature techniques to focus on individual needs. Relaxing light strokes and deep tissue massages are especially for the back area to release stress and muscular tensions while revitalizing strokes and hot stones are treating you from tiredness, and enhancing toxin. It also boosts energy. The nourishing, repairing and protecting skins by Shea butter makes this massage a moment of pure escape with extraordinary benefits. After the treatment, your skin will be softer and refreshed! This treatment starts with a full leg and feet exfoliation, using 2 different Shea formulas, to specifically target each area's needs. Then, complete leg massage will be performed, associating our Aromachologie Gel-Cream for tired legs, enriched with essential oils of cypress and camphor, with Lymphatic Drainage technique, to re-activate microcirculation and help reduce excess fluid storage. At the end, the therapist massage feet with Shea Foot Cream containing 15% of the nourishing and repairing Shea Butter. As a result, you will experience not only your feet becoming softer and smoother, but also legs being lighter and revitalized. This is a hair treatment using 5 herbal hair care series such as Angelica, Lavender, Geranium, Ylang-ylang and Patchouli, traditional Balinese techniques and Cream Bath. It will smooth up your hair like an angel has. This Shirodara has known from ancient India. It begins with hair and scalp massage with their authentic medical shanty oil. Next, you will experience a great relaxing moment that is a slow pouring of warm oil onto the forehead for 30 minutes which stimulates the third eye or the sixth Chakras, the window to the soul. This is a course using Swedish effleurages and Shiatsu techniques, and warmed stones. The stones are places on the seventh Chakra which is traditionally known as a key of the body energetic points. It improves the flow of energy and helps rebalancing a body and mind. It starts off with a 60 minutes Aromachologie massage to stimulate circulation and relieve stress followed by Ayuvedic Shirodara including hair and scalp massage. Then, you will experience shanty oil pouring onto the third eye through scalp for 30 minutes. The course brings a blissful state of serenity and improves consciousness. This is an ultimate Facial Aging Care for anyone who wants to care slackening face, neck, and decollete. They use, “Immortelle” the best product, Divine Cream, the most beautiful flower that keeps the time on the best beauty moment. It is luxury cream among their comprehensive products of L’OCCITANE Skin Care which contains micro capsule Immortelle for making fresh skin and essential oil of lemon myrtle for improving spots. The therapist massages for draining deep lymph and lifting up decollete and face to provide intensive functions to make your skin tightened. This advanced brightening facial is ideal for anyone who concerns about damaged skin from the sun and ageing spots. They use their signature lifting face massage with the organic Immortelle essential oil, provides strong smoothing and firming benefits. As a result, your skin will be incredibly smooth and radiant. This is an ultimate Facial Aging Care for anyone who wants to care slackening face, neck, and decollete. They use, “Immortelle” the best product, Divine Cream, the most beautiful flower that keeps the time on the best beauty moment. It is luxury cream among their comprehensive products of L'OCCITANE Skin Care which contains micro capsule Immortelle for making fresh skin and essential oil of lemon myrtle for improving spots. The therapist massages for draining deep lymph and lifting up decollete and face to provide intensive functions to make your skin tightened. For dehydrated and dried skin + all ages This facial massage is for anyone concerning dehydration and lack of softness of the skin. Shea which is called a secret tree of the nature has an essence to bring up women's beauty. It will provide your skin full of moisturizing and make it like silk. This facial has been designed to meet the specific needs of men's skin especially recommended for men who has oily sebaceous matters and flaccid pores. They use their original products, Verdon Men's Skin Care Serious to smooth and refresh damaged skin by shaving refresh and oil. To deliver ideal moisturization, this refreshing facial incorporates 2 organic Angelica extracts: Angelica Waer & Essential oil. Their patented complex helps the skin smoother. This Relaxing Body Massage is based on Swedish Effleurages, combined with Chinese Acupressure points and long kneading Balinese techniques with their signature Mango Massage Oil. It will relax muscles while enhancing circulation by massaging all over the body from back to hand and legs to feet. You will get a total health and well-being. Enjoy Mango Tango and Mango Body Scrub enriched a whole body with fresh mango from Bali. By this delightfully textured Scrub, your skin will exfoliate. It also makes a body soft and delectable. Enjoy a 60 minutes Relaxing Body Massage with our specific Mango massage oil. To follow, a60minutes signature L'OCCITANE : Terapist will analyze your skin type and recommends the most suitable facial line to meet your needs. Your skin is left rebalanced, more comfortable, and glowing with beauty! 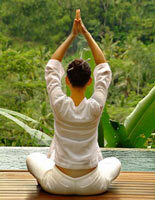 One hour lesson by yoga teachers including a head teacher, Ni Ketut Lilik at the garden spa for each level. 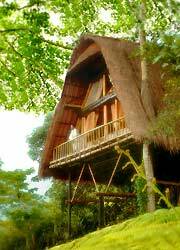 yoga mattress, mineral water, hand towel and free transportation in Ubud area. ※Changing clohtes at garden spa changing room. Also, you can put your stuff in locker. After the relaxing Aromachologie body massage by Swedish effleurages, Chinese acupressure points and long kneading of Balinese style to remove daily stress, enjoy 75 minutes L'OCCITANE Facial. The therapist will customize the facial based on the skin conditions. Your skins and body will be brightened up with aroma of L'OCCITANE. It begins with a 60 minutes Aromachologie Relaxing Massage followed by your desired L’OCCITANE body Scrub, and moves onto its Provencal Bath and a 60 minutes customized facial. The therapists will analyze your skin type and recommends the most suitable facial. As a result, you will be more comfortable with your skin and body. This Shea ultra-moisturizing treatment begins with a Shea Nourishing Scrub containing 5% of Shea butter and walnut shell powder to gently remove dead cells and smooth the skin. The Experience then continues with a Provencal Bath and our Aromachologie Relaxing massage, followed by the application of Shea Body Lotion to deeply nourish and protect the skin. As a result, "your body is left satin soft? Like entirely renewed!" Recommended new-moms This almond slimming treatment focuses on areas of cellulite and fats of legs, a stomach and buttocks. The delicious scrub with crushed almond and sugar removes old horny substance and keep the skin healthy. Then, it moves onto Provencal Bath and or Steam to warm the body up to make it easier to lose weight. Giving Slimming Massage especially on a stomach and buttocks which tend to contain cellulites along a flow of lymph removes body wastes and tighten up the body. Recommended for anyone who stay sitting on a chair for a long time or on travel This detoxifying body treatment with almonds containing tightening up skins will help reducing excess fluid storages in tissues as well as promoting an elimination of toxin which causes tiredness. The Body Tonic Oil, which is a blend of almond, and cameline with red algae extracts and pure essential oils heighten and prolong effects of the massage. This great treatment for hands and nails with Ultra. Rich Shea Butter Scrub and relaxing massage will made your hands softer and nourished includes nail shaping, cuticle treatment and polish application. They massage your legs and feet with Shea Butter formulas. Nail shaping, cuticle treatment and polish application are included. This is a luxurious hand and leg treatment which includes exfoliation and massage of the hands, arms and legs with Shea Butter products. Nail shaping, cuticle treatment and polish application with luxury manicure and pedicure products are also included. There are menus for children over age 12. Payment need to be done by bank transfer at least 7 days before your reservation. Tree Spa on the Mango Tree has only 3 menus. Other menus are done in the regular treatment room. The massage menus are not available for anyone who is pregnant. Hair spa, leg refresh and facial treatments are recommended. A spa on the top of mango tree. Here is the place I absolutely wanted to go when coming to Bali. I wondered how it feels to have spa treatment in the treatment room on the top of tree. When I came inside the treatment room, I could overlook a beautiful rice terrace. It was a really stunning view!! I felt sweet by the mango spa products.